We're just into our second day of the new Spring/Summer catalogue and everyone will be looking out for new inspiration! I've used mostly Sale-A-Bration goodies for my team swaps because this was the focus of our Quarterly meeting. The stamp sets are Bloomin' Marvellous, Vintage Verses but there is something from the new Spring/Summer catty - a new itty bitty butterfly punch which fits the butterfly in the Bloomin' Marvellous set. Here's a close up - I used the Vine leaf embossing folder, also a Sale-A-Bration freebie for this card. It's super easy to do. 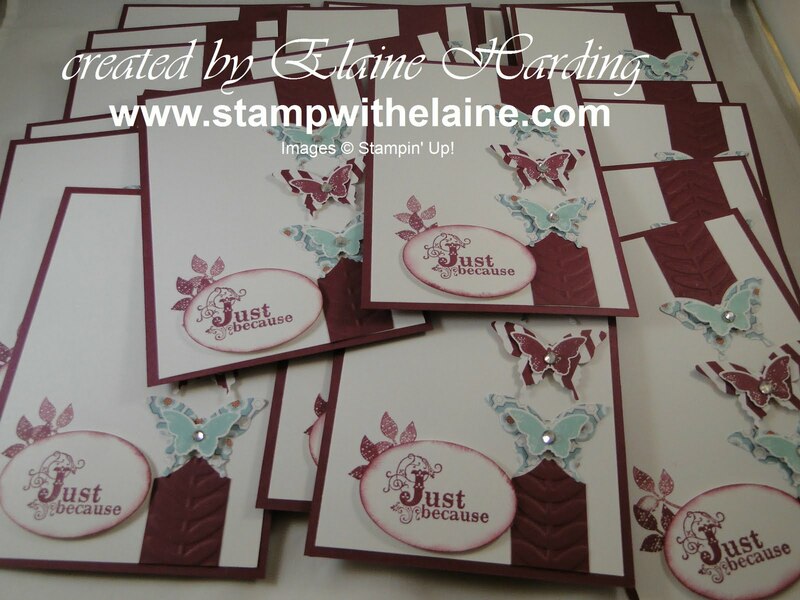 I cut cardstock the same size as the embossing folder and embossed it, then cut it into strips. 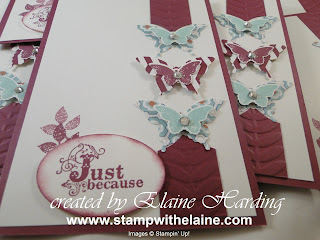 I used the elegant butterfly punch to punch out butterflies from Sycamore DSP, stamped the butterfly from Bloomin' Marvellous and punched it out with our new butterfly punch and layered as shown. Because I was making lots of the same card, it was easier to just stamp on scrap then centre and punch out the sentiment with the extra large oval punch. Otherwise it would've meant getting the stamp-a-majig out. There's nothing more annoying when you stamp the sentiment wonky at the last minute! So that's my little tip - stamp it on scrap, you can position your punch over your stamped sentiment so that it's straight and then attach it to your card with dimensionals and you will get perfect results every time! I have my SAB - Spring/Summer launch today, so must dash. Back tomorrow.